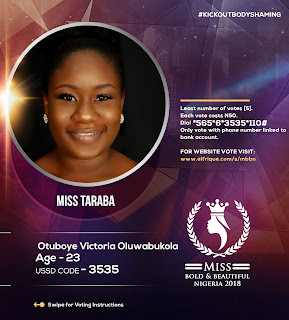 My name is Otuboye Victoria oluwabukola, I am 23years old and I come from Ogun state but based in Lagos, I finished and studied English at the University of Lagos; I am currently serving with an online ICT store in Lagos. I am audacious in nature and I won the Miss Nysc Big Bold and beautiful batch b stream 2, 2018. I was motivated to join the competition because it’s the first of its kind and other than my obsession to Royalty, it serves as a great opportunity for thick and big girls to also show their talents when it comes to modeling and not get body shamed. As a Queen, I intend to achieve many things, one of which is creating an awareness for women hoping to be mothers or are already mothers about the illness called Eclampsia, which relates to child birth before, during or after. The effectiveness of this awareness sets to reduce the rate of mortality amongst women and a certain type of numbness in women as regards child birth.